A U.S. Border Patrol agent keeps watch at a gate on the U.S.-Mexico border fence near San Benito, Texas. 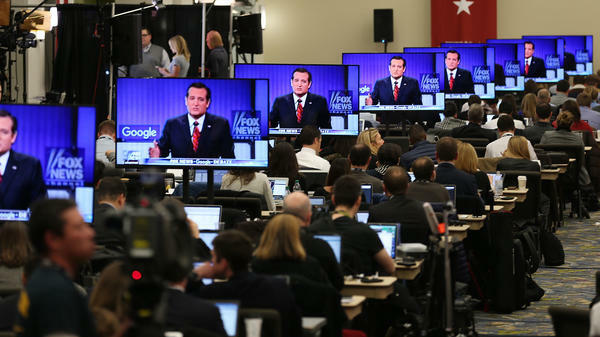 Television screens are tuned to a Republican presidential debate sponsored by Fox News and Google in January 2016. "People who get their news from Fox News actually take the strongest anti-immigrant position of any group we looked at in this survey," one pollster says. When it comes to immigration policy, American opinions often break down along party lines, with most Republicans supporting President Trump's views and Democrats vigorously opposed. But according to a new NPR-Ipsos poll, there is an even better predictor of how you feel about immigration: where you get your TV news. More than 1,000 people were asked about Trump's immigration policies and proposals and about which immigrants should get priority in the U.S. system. The poll was conducted in English and Spanish from June 19 to 20. Most respondents said they got their news mainly from TV. On some questions, people who get their TV news primarily from Fox News or CNN are even further apart than Republicans and Democrats, with viewers of the other big TV networks somewhere in between. Ipsos pollster Chris Jackson says he was surprised to find a connection in the data that is even stronger than partisanship. "People who get their news from Fox News actually take the strongest anti-immigrant position of any group we looked at in this survey," Jackson said. "I can't really say if those views are coming because of Fox. Or if they're watching Fox because they hold those views. But it's a really strong connection. I think it was very surprising," he said. The poll looked at other factors, including whether respondents live in a city, a suburb or a rural area. And there are some differences in opinion depending on where people live. Pollsters also looked at another factor they thought would really matter: whether respondents know anyone born outside the U.S., or are immigrants themselves. "There is definitely a little bit of difference between people who are immigrants, or have an immigrant in their family, and people who don't know anyone from outside the U.S.," Jackson said. "But it really pales when you at look at Republican and Democrat. And really compared to Fox and CNN," he said. For example, the poll asked whether immigrants are "an important part of American identity." Barely half of Fox viewers said yes, compared with more than 70 percent of network TV and CNN viewers. When asked whether the U.S. has a "moral obligation" to accept refugees, only a quarter of Fox viewers said it does. Jackson says some of the biggest disagreements are over what is really motivating asylum-seekers to come here. "CNN viewers, 68 percent of them think these people are fleeing real danger, real persecution. Whereas only 20 percent of Fox News viewers believe that," said Jackson. "On the other hand, 72 percent — so almost three-quarters of Fox News viewers — think that refugee and asylum-seekers are just taking advantage of the system," Jackson said. "They're trying to cheat their way in." It's not surprising, then, that there's a sharp difference in how poll respondents view the separation of migrant families who cross the border illegally, many seeking asylum. "It's really the parents' responsibilities. 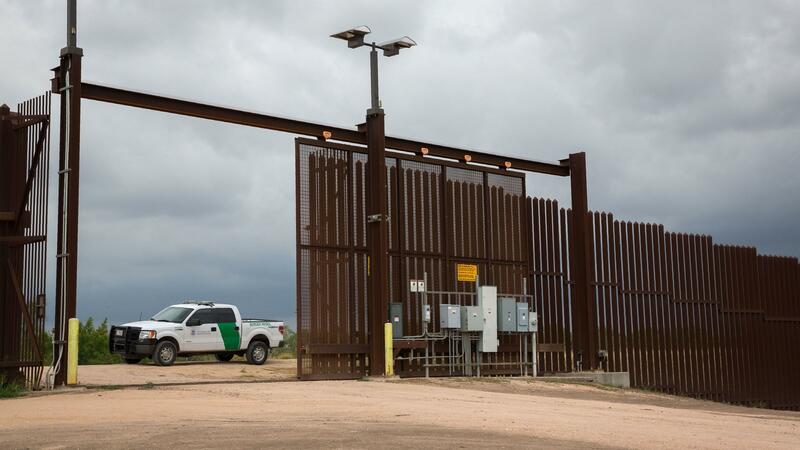 They're the ones who take the kids through this ordeal to try to come to America," said Tricia McCary of Riverside, Calif., in a follow-up interview. McCary immigrated to the U.S. from China, legally, when she was 14, and is now a U.S. citizen. She said she rejected CNN as "fake news" after the 2016 election. Now McCary watches Fox News because she says that it's "unbiased" and that its coverage tends to match her views about undocumented immigrants. "They're taking resources. They're taking jobs. And they're not contributing back to the community," McCary said. Contrast that with one poll respondent who doesn't watch Fox. "I think that Fox News feeds on fear," said Bethany Bunnell, a Christian missionary in Minneapolis, in an interview. Bunnell says she gets her news from CNN and other online sources. She says the United States has an obligation to help people making the dangerous journey to the Southwest border to escape from violence and persecution. "It would have to be a desperate situation to push them to such desperate measures," Bunnell said. "I feel like we have the capacity to help. And why not welcome them?" That said, the problem of what to do about asylum-seekers divides Bunnell's own family, just like it does the rest of the country. She says her parents watch Fox News. Immigration has become a central wedge issue in American politics. And whether you identify as Republican or Democrat is a very good indicator of how you feel about the border wall, also about the travel ban and a host of other immigration policies. A new poll from NPR and Ipsos shows there is an even better predictor, though - where you get your TV news. Here's NPR's Joel Rose. JOEL ROSE, BYLINE: The latest immigration story to divide the country is the separation of migrant families at the southwest border. Here's how it played on CNN. DON LEMON: Our government in your name and my name as well took the smallest, most defenseless children away from their parents. That is an outrage. ROSE: And here's a clip from Fox News on President Trump's policy. BRIAN KILMEADE: Like it or not, these aren't our kids. Show them compassion. But it's not like he's doing this to the people of Idaho or Texas. These are people from another country. ROSE: NPR and Ipsos polled a thousand people to try and figure out what shapes our views about immigrants and immigration. Republicans and Democrats are often 30, 40, even 50 percentage points apart on the big issues. But people who primarily get their TV news from Fox and CNN are even further apart with viewers of the other big TV networks somewhere in between. Ipsos pollster Chris Jackson says he wasn't expecting to find a dividing line even stronger than partisanship. CHRIS JACKSON: People who get their news from Fox News actually take the strongest anti-immigrant position of any group we looked at in the survey. ROSE: Did that surprise you? JACKSON: I think it was very surprising. I can't really say if those views are coming because of watching Fox or if they're watching Fox because they hold those views, but it's a really strong connection. ROSE: We looked at other factors, too - whether you live in a city, suburb or a rural area - and there are some differences in opinion depending on where you live. We also looked at another factor we thought would really matter - whether you know anyone born outside the U.S. or are an immigrant yourself. JACKSON: There's definitely some difference there, but it really pales when you look at Republican and Democrat and really compared to Fox and CNN. ROSE: We asked, for example, whether immigrants are an important part of American identity. Barely half of Fox News viewers said yes compared with more than 70 percent of network TV and CNN viewers. We also asked whether the U.S. has a moral obligation to accept refugees. Only a quarter of Fox viewers said we do. Pollster Chris Jackson says some of the biggest disagreements are over what's really motivating asylum-seekers to come here. JACKSON: CNN viewers - 68 percent of them think that these people are fleeing some sort of real danger, real sense of violence or persecution, whereas only 20 percent of Fox News viewers believe that. Almost three-quarters of Fox News viewers think that refugee and asylum-seekers are just taking advantage of the system. They're trying to cheat their way in. ROSE: It's not surprising, then, that there's a sharp difference in how our poll respondents view the separation of migrant families who crossed the border illegally, many of them seeking asylum. TRICIA MCCARY: It's really the parents' responsibilities. They are the ones who take the kids through this ordeal to try to come to America. ROSE: Tricia McCary lives in Riverside, Calif. She immigrated to the U.S. from China legally when she was 14 and is now a citizen. McCary told me she rejected CNN as fake news after the 2016 election. Now she watches Fox News because, she says, it's unbiased, and she says its coverage tends to match her views about undocumented immigrants. MCCARY: They're taking resources. They're taking jobs. And they're not contributing back to the community. ROSE: Contrast that with one of our poll respondents who doesn't watch Fox News. Beth Bunnell is a Christian missionary in Minneapolis. BETH BUNNELL: I think that Fox News feeds on fear. ROSE: Bunnell says she gets her news from CNN and other online sources. She says the U.S. has an obligation to help people making the dangerous journey to the southwest border to escape from violence and persecution. BUNNELL: It would have to be a desperate situation to push them to such desperate measures. And I feel like we have the capacity to help. And why not welcome them? ROSE: That said, the problem of what to do about asylum-seekers divides Bunnell's own family just like it does the rest of the country. She says her parents watch Fox News. Joel Rose, NPR News. (SOUNDBITE OF FEVERKIN'S "CALENDAR PROJECT: FEBRUARY") Transcript provided by NPR, Copyright NPR.